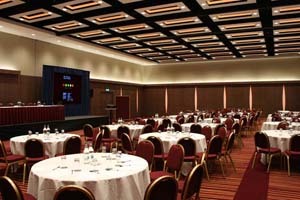 Ilec Conference Centre in London has reopened following a £5m refurbishment. Improvements include the installation of an ‘intelligent’ room control system that senses the configuration and size of each room and adusts air conditioning, lighting and sound accordingly; while a ceiling-mounted LED lighting system uses up to 12 preset colours to create ambiences suited to different event types. The conference and meeting venue’s London Suite boasts over 1,500 sqm of space, which can be configured into a total of nine modular rooms. Its newly-developed pillar-free ballroom can accommodate events, conferences and meetings for up to 1,200 delegates. The centre also has five syndicate rooms, all with natural daylight and an in-house AV production team can offer clients services including event production, equipment hire, scenery building and video production. Patrice Millot, Ilec Conference Centre’s general manager, said: "This significant investment will ensure that Ilec Conference Centre is positioned as one of the most desirable venues for conferences and meetings, sports events, fashion shows, award ceremonies and weddings across the entire capital."